There’s an old trick out there to catch all the new dogs that come into town. The screenshot is taken in the middle of the busy Brooklyn neighborhood, in the middle of the day. Do you see the danger already? If not – here’s a little hint: there are Time Warner Wi-Fi hot spots in New York, but they are in Manhattan and Queens, not Brooklyn. Something else – the location of the spot where I got this reading is exactly out of reach the only 3 available Optimum Wi-Fi hot spots on their map, so I definitely did not expect to see 69% of signal power – more like 10 – 20%. 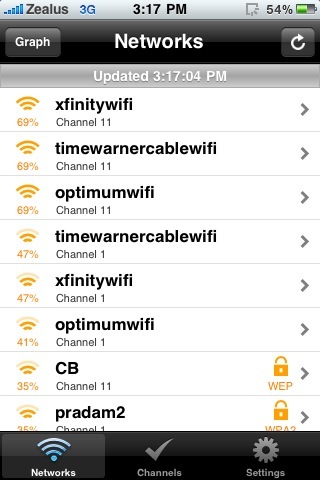 So what the heck is going on with all three networks, including XFinity Wi-Fi, having the same signal strength? Someone had set up a rogue router that poses as XFinity WiFi, Optimum WiFi and Time Warner WiFi at the same time to capture your data. Those network SSIDs you’re seeing – all fake. If you bought any recent laptop, chances are you have your firewall set up and enabled and it will take some time and dedication to break into your laptop. Not to say it’s impossible – it’s just requires time and effort and knowing you’re actually there. With fake Wi-Fi hot spots, you can set up a script that will capture anything you send over rogue Wi-Fi network automatically, so anyone connected through is just voluntarily giving up their data to someone who’s willing to listen. Since your device will most likely connect to a known Wi-Fi automatically – it will hook you up with fake one just as easy, without you even realizing it. No time, no effort – everything just happens automatically as long as the rogue SSIDs match those of real SSIDs of public networks. It’s like you’re shouting all your secrets and passwords in the middle of the street: if anyone listens close enough – you’re going to have a problem. How to prevent this? Make sure your device – be it laptop, iPhone or iPad – asks for your explicit permission to connect to Wi-Fi that’s not your at your home or at work. Before you go someplace – check what Wi-Fi options are available and don’t use those that seem to good to be true. Apply some common sense to the situation and don’t fall into the trap of fake Wi-Fi hot spot, or it may prove to be too hot.